Renseignements supplémentaires sur demande ! 2 autograph letters signed by Hans BELLMER [to Georges Hugnet], dated 1948, in Toulouse. Bellmer despairs of gallerist and publisher Alain Gheerbrant behavior which delayed again and again the edition of Les Jeux de la poupée initiated in 1946 by a subscription bulletin. Gheerbrant finally gave up and the book has been published in 1949 by Éditions Premières – EUR 3500. 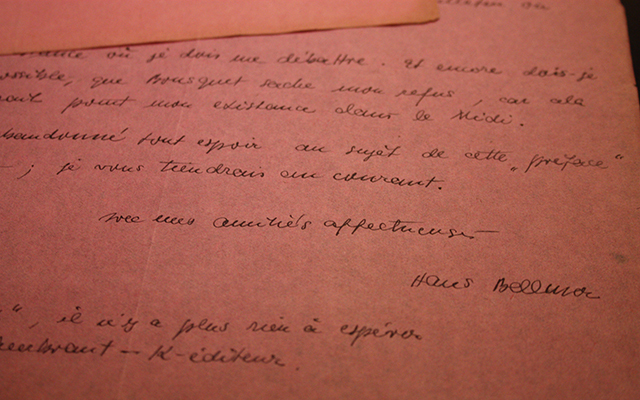 • Philippe SOLLERS, typewritten draft with manuscript corrections of subversiv and iconoclast article titled Conseils à un jeune écrivain, in the style of Rilke’s Advice to a young poet – EUR 800. Please ask for any details.